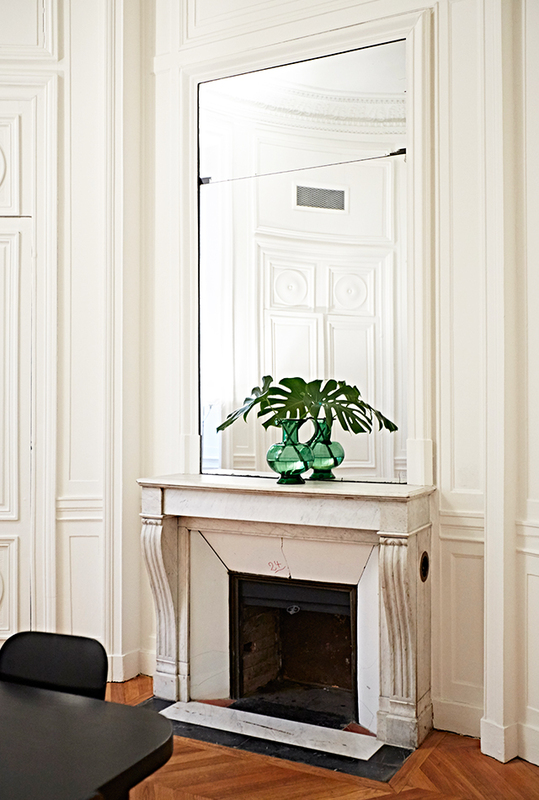 Céline, spearheaded by designer, Phoebe Philo — who has made her own brand of minimalism the most covetable thing in fashion today — has recently opened its headquarters in the historic hôtel particulier in Paris. 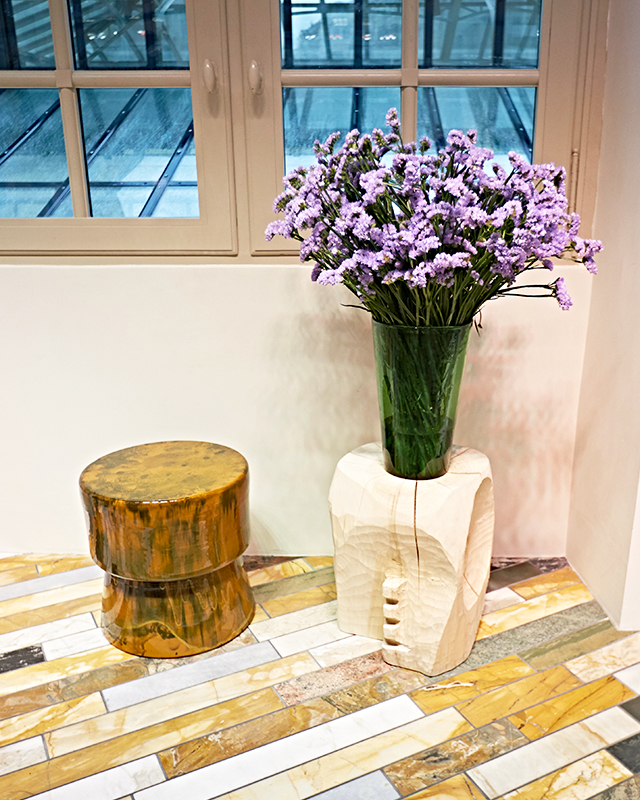 In the heart of Paris, across the street from the historic cradle of Bibliothèque nationale de France, Céline has recently opened its new headquarters. 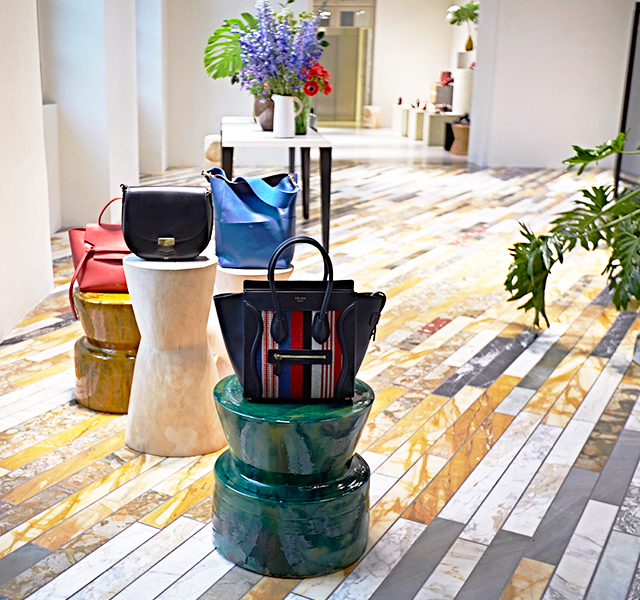 For the first time, the company, who under the auspices of Phoebe Philo has become the darling of the fashion world, has united all of its Parisian operations under one roof and can now proudly call itself a maison. 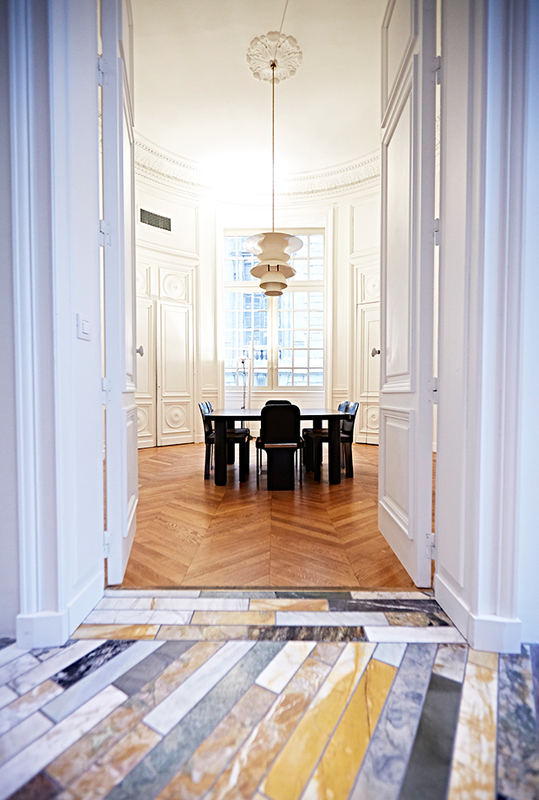 The building that Céline now occupies has a rich historical pedigree. It was built in 1635 by Jacques Tubeuf, a counselor of King Louis XIII. Shortly thereafter, none other than Cardinal Mazarin moved in, before buying the building outright in 1649 to house his sprawling art collection and library. In the 18th Century, the building housed the Paris Stock Exchange, and went through several incarnations thereafter. As befitting the reigning queen of minimalism, the hotel particulier meets you with the subtle "CÉLINE" carved into its façade. 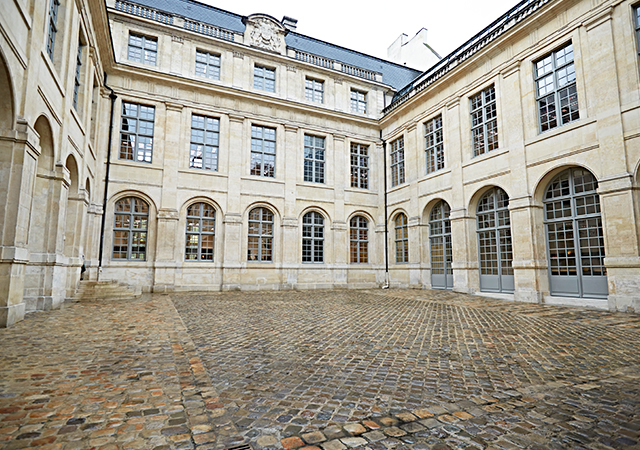 Behind heavy doors there is a stone-paved courtyard, framed by the company's headquarters which includes the studio (where all Céline samples are made), the showroom, and the press and commercial offices. All these operations used to be spread over three locations in Paris and were finally united into one space in November 2014. The interior of the stunning space, just like everything else at Céline, has been meticulously designed from top to bottom by Phoebe Philo herself. The ground showroom spaces, where rows of Céline's best-selling bags would set any fashionista's heart aflutter, are starkly lit. 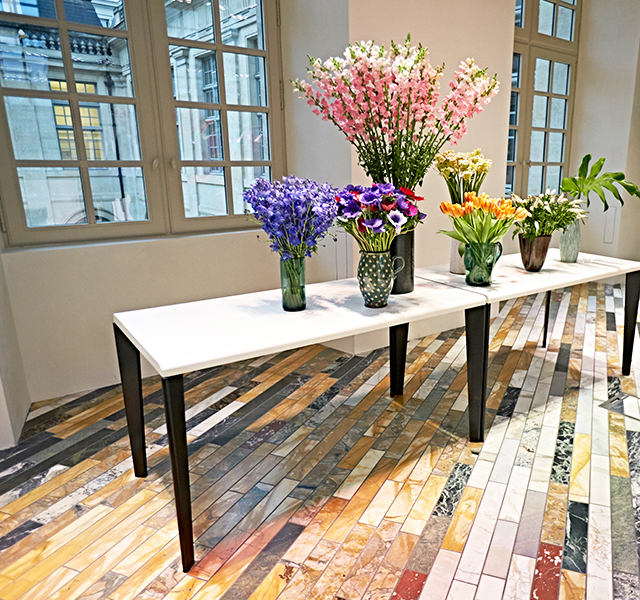 They have gray plaster walls and marble parquet floors that mimic those found in Céline boutiques across the world. The tall ceiling has original wooden beams that are protected as historical heritage. During our visit the studio — located in the back of the ground floor — was abuzz with a team of expert tailors cutting patterns and carefully hand-sewing sequins onto gowns in preparation for Céline's March show. Philo's design studio is located in London, but all the samples are produced here. 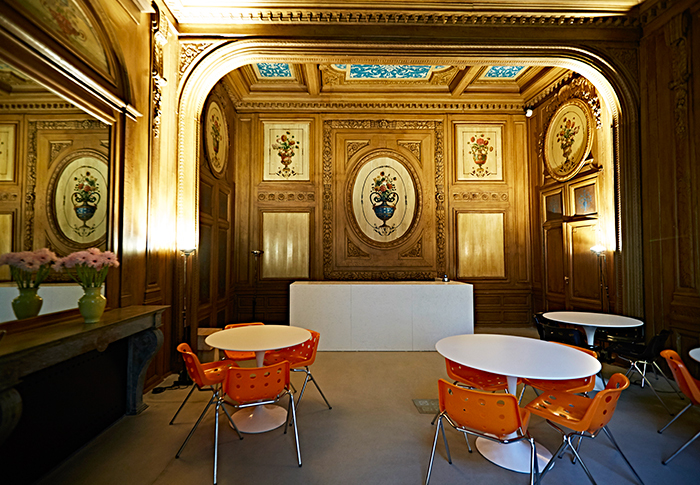 The second floor can be reached by a magnificent spiral staircase that brings you into a room with carved wooden walls — Mazarin's study — which is also a historically protected part of the building. From there, one walks through an additional showroom space with racks of Philo's cerebral clothes and shoes. Here again, Philo's touch rules everything from the display cases down to the smallest piece of furniture and the flowers that are a constant presence in her world. Philo is a true auteur in her ability to build not just desirable handbags and clothes, but an aesthetically unique universe, and the new Céline headquarters are a culmination of her formidable creative abilities.